What do you think of when you think of who a “steady defenseman” is? You would think of someone who is not flashy, but gets the job done. You would think of someone who doesn’t appear on the score sheet very often, but still has a dramatic impact on how a game is decided. You would also think of someone who was able to do those things for many seasons. Former Sabres, Blues, and Penguins defenseman Jay McKee sure fits the bill of steady defenseman. In his 14 year NHL career, McKee appeared in 802 games, scoring 21 goals and 125 points, while amassing 622 penalty minutes. McKee also was a part of 2 different Sabres teams that made deep playoff runs, including a trip to the Stanley Cup Final in 1999, when the Sabres lost to Brett Hull and the Dallas Stars in 6 games. McKee has played in a total of 60 playoff games, scoring 9 points. Since his NHL playing days, McKee has gotten into coaching. In 2011, he became an assistant coach with the Rochester Americans of the AHL. He left that position and became a player/coach in the Allan Cup Hockey League. After 2 seasons there, McKee was brought on by the Erie Otters to be an assistant coach. We had the chance to sit down with Jay McKee to talk about several things. He shared his thoughts on his former teammate in Buffalo Dominik Hasek. 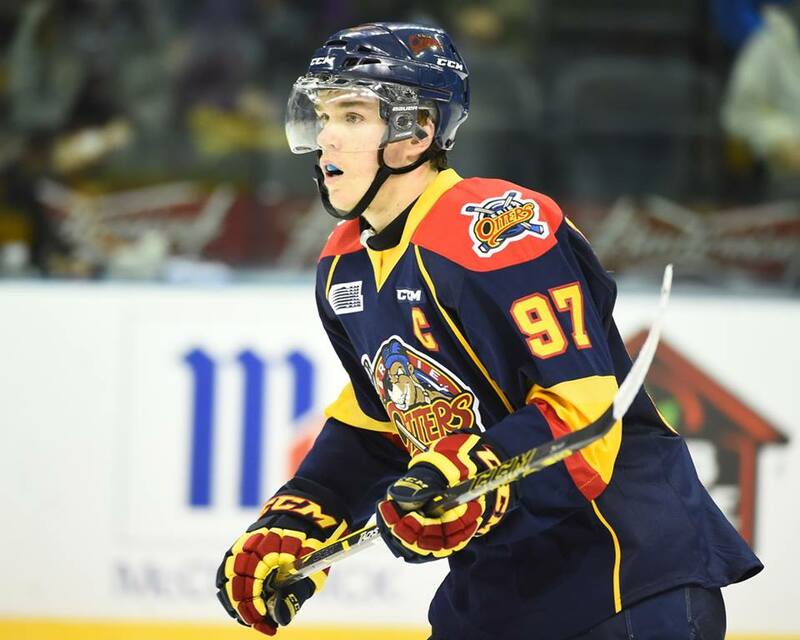 He also gave some insight into the sides of Connor McDavid and Dylan Strome that fans really don’t get to see. We also talked about his desire to possibly coach in the NHL someday. THW: Well Jay, you had the chance to be in Buffalo for Dominik Hasek’s number retirement. What would you say is the greatest memory you have of Hasek? Jay McKee: It would be hard to pick one memory. He had so many incredible saves over his career. I was on the ice for some of them, and on the bench for some, and saw the highlight reels of others. I think for me to pinpoint one time or one scenario that would be a highlight is being part of the team with him the time we were in the Stanley Cup Final. We had a team that wasn’t expected to make it that far. There were a lot of hard workers and based around team defense, and him (Hasek), and it was just an exceptional year and a time that I will never forget. THW: Now that half of the season is over for the Erie Otters, what would you say has been your most memorable coaching moment thus far this season? McKee: I think our start was a pretty neat experience. It’s not often you get to start the season the way we did, going somewhere in the teens in games before losing in regulation, you don’t expect that. I think just the overall experience, getting to familiarize myself with the players, and getting to know them on a personal level. Everyone is real comfortable with each other in that locker room, developing that chemistry. Now is the time to button up and get ready for the stretch run. THW: And you get to see Connor McDavid and Dylan Strome on a regular basis. Just give us the sense of what you see in them on a daily basis that maybe some of us don’t get to see? McKee: I think that as a staff and as a team, we get to see their personalities. That’s something that the average fan, the majority of people, don’t see. I think Connor and Dylan are two of the nicest, most humble, humorous kids that you can find at this level. They both come from great families. They are just a treat to be around everyday off the ice. THW: I’ve noticed as of late, you have led some of the practices for the Otters. Talk for a minute about the impact that Kris Knobloch (Otters Head Coach) has had on you and your development in coaching. McKee: Kris has been great. He is an exceptional head coach. But he is great in the sense that he allows myself and Vinny (Assistant Coach Vince Laise) to take over the meetings that are typically a head coaches’ meeting, whether it is a pregame speech before a game, or video assessments, or drills on the ice. As much as he is our head coach, he allows us to gain that experience through doing things, that on most teams, only head coaches would do. That’s a credit to Kris, and the type of person he is to allow us to do something like that, and that’s for the development of ourselves. That’s why he is doing that. THW: So is it your desire to be a head coach in the OHL, or do you hope to one day make it as an NHL head coach? McKee: I think any coach at any level would say that they would want to coach at the highest level possible. If you are a person who wants to success in life and to the best of your abilities, you set your goals as high as you can. So for me, I’d definitely like to be able to coach at the NHL level someday, but it’s a process, and there’s a lot to learn. You don’t just go from being a player for a lot of years, to being some exceptional coach. There’s a lot of things you have to learn. There’s personalities you have to manage. There’s different types of video you have to learn. And even the teaching process is not something that you can just step into, and be a great teacher. I’m putting my dues in, and learning everyday, and enjoying it. It could be at this level someday, it could be wherever it takes me. We want to sincerely thank Jay McKee for spending a few minutes with us. He is one of the main reasons why the Erie Otters are one of the best teams in the OHL. Don’t be surprised to see him coaching in the NHL someday. He will be a good one.